Even if we solve the methane problem, shale gas alone won't save us. For President Obama, fracking is a key weapon against global warming. Abundant natural gas, he said in his State of the Union address this year, is a "bridge fuel" to ubiquitous renewable energy—the key to securing economic growth "with less of the carbon pollution that causes climate change." Not everyone agrees. In fact, the debate over whether natural gas is the antidote to our deadly addiction to coal, or a faux climate change solution that will stall the clean energy revolution, is one of the most hotly contested environmental questions of the day. It has produced a host of recent studies examining complex questions about global energy markets and the specific chemistry of various greenhouse gases. The latest volley in that debate is out today in a new paper in Nature. Rolling together a suite of models that project energy use, economic activity, and climate systems through to 2050, the study finds that natural gas is essentially useless as a climate solution unless it is buttressed by new policies that discourage carbon pollution and promote investment in renewable energy. In other words, fracking alone won't save us. "In the absence of policies that help natural gas play a positive role, you won't make things much better," said Jae Edmonds, Chief Scientist at the Joint Global Change Research Institute and one of the study's lead authors. "It's kind of a wash."
The study compares two constructed scenarios: "conventional" gas, in which the fracking boom never happens and the world produces shale gas only on the level it can with older technologies; and "abundant" gas, where gas supplies shoot up and the cost drops as fracking technology developed in the US spreads across the globe. Our actual reality is somewhere in between those two extremes, Edmonds admits; the idea is to set up a "bounding exercise" to see what a fully realized global shale revolution would really look like, compared to a baseline where it doesn't happen at all. The other key assumption that (fingers crossed!) doesn't quite match reality is that there will be no new climate policies—a national or global price on carbon, for example, or new incentives for renewable energy—introduced between now and 2050. When the models run, they simulate fluctuations in supply and demand for coal, oil, gas, and "low-carbon" (including wind, solar, geothermal, hydro, biomass, and nuclear power). That energy mix translates into global greenhouse gas emissions, which translate into global warming (climate "forcing," in science jargon). The study includes five separate models, each designed by different independent teams of scientists, that measure the same thing but are tweaked and calibrated differently. The specific outcomes vary, but all five models tell the same story: By 2050, global temperatures rise beyond the internationally agreed-upon limit of 2 degrees Celsius (3.6 degrees Fahrenheit) in both the "conventional" and "abundant" scenarios. In other words, simply using more natural gas, even as it displaces far dirtier coal, has an almost negligible effect on climate change. There are two reasons for that: First, cheap gas also takes market share away from clean energy. Even though gas's carbon footprint is about half that of coal, it's obviously not as low as sources like wind, solar, or nuclear, and is therefore never an adequate permanent substitute for them. Second, the combination of cheap gas and no new energy efficiency policies means total energy consumption goes up. Together, these two effects offset any carbon savings that result from a move away from coal. You can see the results of the the five models below—each has its own vertical column. The blue line is "abundant" gas; the red line is "conventional" (the gray shading represents the range of possible outcomes reported in existing peer-reviewed literature). The first horizontal row shows global natural gas consumption. As you might expect, having more cheap natural gas means the world uses more of it. The increased consumption comes in part because natural gas replaces more expensive fuels (by 2050, it replaces 18 percent of coal and 17 percent of low-carbon sources). Gas consumption also increases in this scenario because total energy use increases. But in the subsequent rows, the blue and red lines lie close together, suggesting the difference between the scenarios—and thus the impact of widespread natural gas—is small. The second row shows global carbon emissions; the third shows "radiative forcing," which is scientists' metric for the greenhouse effect; and the fourth shows temperature change. Interestingly, the researchers reached the same conclusion when they recalibrated their models for both high and low levels of fugitive emissions of methane, the potent greenhouse gas that is known to leak from nearly every stage of the natural gas production process and that is often cited as an argument against fracking's supposed climate benefits. 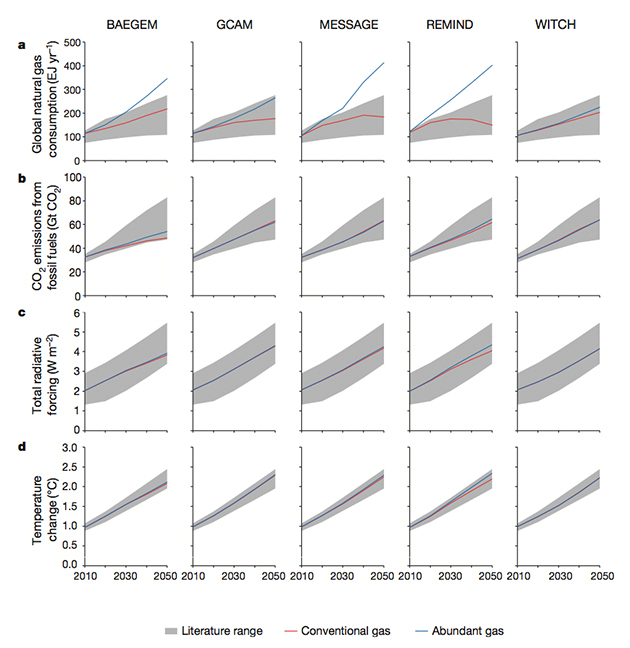 In other words, the study suggests that methane is a bit of red herring: It's not the main reason fracking doesn't work as a climate solution. By the same token, fixing the methane problem won't make natural gas work as a "bridge." So what's the upshot? Is it time to give up Obama's dream of fracking our way to a stable climate? Not exactly. For one thing, as energy analyst Alex Trembath of The Breakthrough Institute points out, the models make a number of assumptions (most importantly, that technological advances will halve the cost of extracting natural gas by 2050) that are basically impossible to predict with any certainty. "It's exactly as realistic as any projection over 40 years," he says. "Which is to say, not very instructive." Still, the study is useful in that it adds fresh data illustrating a flaw in the "all-of-the-above" approach to energy—a flaw that many scientists and energy analysts have long pointed out. Without a policy framework that explicitly charts the course to abundant low-carbon energy, merely flooding the market with natural gas is no better, from a climate perspective, than continuing to rely on coal. Of course, there are other benefits to cutting our coal consumption. Outdoor air pollution, to which coal-fired power plants are a leading contributor, caused nearly four million deaths worldwide in 2012. Natural gas plants work better than coal as a backup to renewable power, because they can be fired up much more quickly when the sun isn't shining or the wind isn't blowing. And regardless of the source, abundant, inexpensive energy is a boon to the 19 percent of the global population that today lives without electricity. For that reason, University of Chicago geophysicist Ray Pierrehumbert argues that anti-fracking activists should focus their energy on climate policies—he suggests taxing natural gas and using the revenues to support renewables. What he doesn't want to see is a ban on fracking, which, he says, "would just mean more coal."